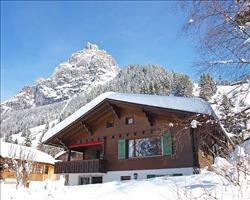 The ultimate guide to Kandersteg ski holidays. A pretty Swiss village, a pint-sized ski area and an absolute shedload of activities. Downhill skiing's just one of many outdoor pursuits in this neck of the woods, with others including cross country, ski touring and winter walks. Besides being home to the international Scout centre, close to the Reichenbach falls (where Sherlock Holmes and Moriarty met their fabled fate) and home to the Dhammapala Bhuddist monastery, Kandersteg is a fabulous winter destination. In a valley surrounded by UNESCO protected peaks, this is a village of traditional Swiss wooden chalets, where ancient brick and stone bridges cross the river Kander and a charming chapel peers over all. If that’s not enough to make you feel like you’ve gone back in time, come here on the famous Belle Epoque week, when locals and visitors dress like their ancestors did a hundred years ago. The whole village is done up in turn-of-the-19th century elegance, and events include a millinery competition where the best hats win, rides on horse drawn carriages, tea dances and vintage shopping. Kandersteg has far from the biggest ski area in Bernese Oberland, with just a handful of slopes accessed from either end of the village. But when you look at the armful of other activities available, there’s more than enough to fill a week with: winter hiking is huge here, and you’ll find activities like sleigh rides, snowshoe tours, tobogganing, ice skating and ice climbing on frozen waterfalls. View our detailed Kandersteg snow forecast or snow report and see all live webcams, piste maps, road and travel maps and lift pass prices. For a picture of historic snow conditions see the snow depths month by month with our Kandersteg snow history. There are two small ski areas, which can be accessed from the Oeschinen gondola (about a 15 minute walk from the centre) and the Sunnbüel cable car (reachable by bus). Oeschinen is the bigger of the two, home to Oeschiland with its children’s and beginner’s slopes and a total of 12km of red and blue pistes. Confident skiers and snowboarders can glide right back to the cable car base station. The Sunnbüel area’s higher, with three blues and a longer red. Whether you want to have a go at ski jumping or just spectate, the new Lötschberg, Blüemlisalp and Bire jumps are competition standard jumps kitted out with ice lines and snow machines. A number of ski touring routes set off from Sunnbüel, including Unders Tatelishore, Altels and Balmhorn. The Rinderhorn tour is the longest, taking a good 9 hours and featuring a total climb of 1400m. Cross country skiers are wonderfully catered for, with trails carefully planned to form loops. Experienced classic and skate skiers can take on the 14km Höh panorama, which is nothing short of spectacular, climbing to 1318m. There’s also an easy 3km classic trail along the Kander river, and both techniques can practice on the a 6km night skiing trail from Hotel Des Alpes. A lot of the restaurants and bars here are part of hotels – like the Bernerhof which is brilliant for a sophisticated supper (save room for the Meringue Chantilly dessert). It’s connected to the Kota hut, which you can book for a rustic fondue. Nico's is great for fine dining, while Cafe Schweizerhof does big portions of European favourites for a good price. If you like to have a go at different activities, there are plenty on offer here. We love the fast 3.5km sled run to the Oeschinen gondola base station (often floodlit in the evenings, and there are indoor and outdoor ice rinks for skaters. Fat biking is becoming more and more popular in these parts, and at a slower pace, horse drawn carriage rides make for a spectacular way to explore the region. Up in the air there is a paragliding school, making use of the Allmenalp Cable Car. Hot air ballooning is also popular with International Ballooning Weeks organised. A rare attraction in the Alps is the option to try ice fishing at the high altitude Lake Oeschinen (1578m). There are 55 kms (30 miles) of tracked winter hiking paths. From the easy village tour to the alpine pass hiking tour - Kandersteg offers all difficulty levels. Snowshoe rentals and tours are available. Glacier trekking, climbing and ice climbing are available through Kandersteg Mountaineering School. For horse riding The Royal Hotel Bellevue Park's stables offer guided rides and riding lessons. Sleigh rides are also available in the resort. The resort's indoor ice rink is located next to the railway station and one minute from the village centre. Ice hockey, short track skating and curling are available as well as recreational skating. For training purposes and in winter weather there's a climbing wall at the ice rink and an indoor tennis court is open for business from April onwards each season. There are indoor swimming pools at the hotels Alfa Soleil and Parkhotel Gemmi as well as a 25m public pool at Frutigen (15 minutes from Kandersteg), part of a large fitness centre. An unusual option is indoor mini-golf (nine holes) and there's several bowling lanes and billiards tables in the hotels. There is also a museum, occasional organ concerts in the church and slide shows. When is the best time to ski Kandersteg? The two pint-sized ski areas here have altitudes between 1174m and 1920m. With no snow sure offerings above 2000m, the best time to visit is usually the middle of the season, when the snow has had a chance to build up but before the spring sunshine sets in. The good thing about Kandersteg is that even when the white stuff isn’t in peak condition, there are oodles of other activities to enjoy. Check when the famous Belle Epoque week is happening this season for a step back in time, where everyone dresses up in costumes from days gone by. The Pelzmartiga are back over the New Year in Kandersteg, bringing an exciting feel to the village as they parade through the streets rattling cowbells. Most of the hotels put on gala dinners too, seeing out the old year with excellent food and celebrations. Half Term in Kandersteg is great if you want to mix skiing with other snow activities, in one of Switzerland’s prettiest villages. Two small, forgiving ski areas with excellent slopes for children make this a terrific place to bring the brood. There isn’t miles of skiing, but with more activities than you can shake a ski pole at, there’s never a dull moment. Groups looking for a quiet base will love Kandersteg, where time can be split between skiing the Oeschinen and Sunnbüel ski areas, setting off on winter hikes and snowshoe tours or tackling frozen waterfalls on incredible ice climbs.